The first official expansion pack to Sid Meier's Civilization II. Conflicts in Civilization Scenarios is a set of twenty new scenarios. Interestingly, for those twenty scenarios only twelve were made by the developers. This is Sid Meier's Civilization II expansion pack. 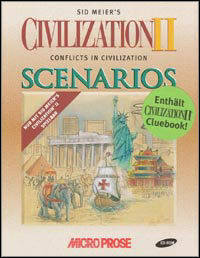 The first official expansion for Civilization II, a popular turn-based strategy game. This pack comes with 20 new scenarios, developed by both the creators of the game, as well as its fans. Additionally, there are new music tracks to listen to. Among the scenarios, the majority are battles that refer to actual history, such as the American Civil War, conquests of Alexander the Great, crusades or World War I. It doesn’t mean that we won’t find any fantasy missions, though - quite the contrary. The players bored by classic conquest may try to stop an alien invasion or create living conditions after a nuclear apocalypse. Moreover, Conflicts in Civilization Scenarios contains 8 fan-created scenarios that were deemed the best by the developers. Game score 7.8 / 10 calculated out of 27 players' votes.